Let’s take a trip to Old MacDonald’s letter farm to sing our ABC’s with some silly friends before singing a silly alphabet song! Then we’re going to learn about different words that begin with each letter in My First ABC Book. Then children will learn all about short vowels, long vowels, and consonant blends. 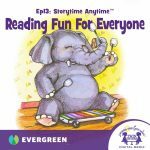 Fun songs, silly stories and sound effects will making reading fun for everyone.